Flags are flying! Developing student voice and ownership in our school is important to us. Where possible we strive to foster student voice. Examples of this can be seen at Muster, at student government meetings, and now in the hallways with the flags that student government has posted (with Velcro for easy removal) representing the countries of origin of our current student body. Thanks to Mr. Marini for hosting the movie “Inception” after school on Wednesday for high school students, and “Despicable Me” for the middle school students last week. It is nice to see high school and middle school developing some separate identities through different activities. While we talk about getting our students to write papers, Mr. Marini has guided students through the process of actually making paper. The hand-made sheets are beautiful. As EWSIS students climb the stairs every morning to go to their first class, Gandhi reminds them to “be the change they wish to see in the world”. Gandhi’s wisdom is one of the nine voices, including those of Mother Teresa, Max Ehrmann, and Akio Morita, which are featured on the new school banners that hang prominently over every stairwell. Each quote is bound by the words honor, excellence, curiosity, and celebration, the four guiding values of East-West. Students crossing Stairwell E to get to their language classes know that Martin Luther King Jr. said it best: “Faith is taking the first step even when you don’t see the whole staircase.” The glossy professionally-made banners reflect a small ambitious school that has come a long way since taking its first step. The number of students has tripled to 600 since the school opened in 2006, but EWSIS received the highest grade of an A for both middle and high school, the only 6-12 school in Queens to do so, in NYC school progress reports for the past two years. 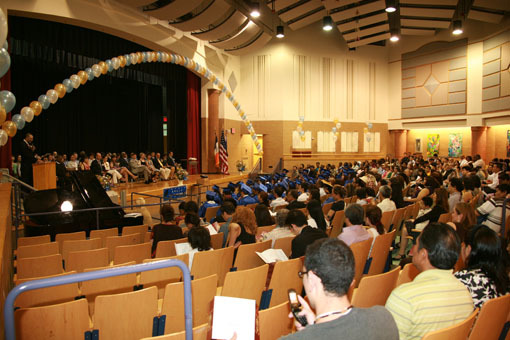 Last year EWSIS held its first high school graduation. With sixty-five students graduating, sixty-four continued on to college and one joined the Navy. EWSIS and Flushing community leaders will officially unveil the banners in a brief ceremony on January 13, 2011, preceding a meeting of the East-West School Community Advisory Board. In recognition of its potential as a model Chinese language program for the U.S., strong local leadership, demonstrated commitment to international exchange and collaboration, and global vision for the future, the East-West School of International Studies has been accepted as a member of the second cohort of schools in the Hanban-Asia Society Confucius Classrooms Network. Along with a start-up cash award of $10,000, EWSIS will work to enhance their existing Chinese language program through unique opportunities such as being matched with partner schools in China and having students, teachers and administrators conduct exchanges and joint projects. They will also receive 1000 volumes of Chinese language learning materials. Welcome to the new East-West blog! This is where you can get a glimpse into what goes on at the school from day-to-day. We’ll provide news on what we’re learning about in our classrooms, as well as school trips, events, and programs. Be sure to bookmark the site and keep checking back for updates. As a note, the main school website is still the place for official announcements and general information. For those of you who are new to our school, feel free to check out the main website at http://www.ewsis.org and read our “About” page. December 20, 2010: As part of their Advisory Community Project, five East-West students organized a charity bake sale and raised $45 in one class period. The money will be donated to the American Red Cross. Joanna Song, Jessica Lei, Karen Xu, LeSa Nan, and Saeeda Goodman baked or purchased all the items and hosted the sale in Ms. Braverman’s classroom. This school year, every Academy participated in a community service project of their choice. Ms. Pechersky’s 10th grade Academy students discussed many opportunities and decided to organize a clothing drive to help people in need. During several months, they worked to mobilize the East –West community and have as many donations of gently worn clothes as possible. The students led by their own example. They brought in multiple items several times. They regularly spoke to the students and staff in Muster. They engaged their families and friends outside of school. At the same time, during Academy, they learned the rules and skills of public speaking to make their appeals more convincing. They explored our Queens community resources online, analyzed their findings, and decided where to donate the clothes. While planning, preparing, conducting, and completing the project, the students could learn that there are always ways to help others. You don’t have to be rich or to donate money. Even people of modest means can make a difference in the lives of others. The main thing is to be kind, generous, understanding, and tolerant. There are many hardworking people in difficult live situations, who are poor and need help. There are many reasons and factors out of their control that make people poor. The goal of the society and each local community is too help these people overcome the difficulties. The community’s response was overwhelming. Many students and staff members brought in bags full of shirts, pants, shorts, dresses, skirts, jackets, sweaters, and smaller items, such as hats, gloves, baby clothing, towels, bags, and pieces of fabric. As a part of the project, students folded, sorted, and counted the items. By the end of the clothing drive, there were 336 (!) items in more than 20 bags! On April 7, Ms. Pechersky and her students went to the Goodwill Donation Center in Astoria to deliver them. They concluded the project by celebrating their community spirit at a Japanese fusion cuisine restaurant nearby. Ms. Pechersky’s Academy wants to thank the entire East-West community, families, and staff members for opening their hearts and being responsive to the needs of others. There is no doubt that the great variety of gently worn, almost new, and brand new items that were donated will be a great support to the people in need during all seasons and for many occasions.